This will be our fifth summer at our lake house. We always look forward to heading South and spending time on the lake with family and friends. There always seems to be a project, which is part of the fun. This year we hope to tackle the Banana Room. Our lake house is almost 50 years old. The original owner Mr. E. named it Happy Hill. There is a marker on the foundation that says the name and year it was built. We think it is perfect! Mr. E. passed away the year before we bought it. His children sold the house to us and gave us a box of paperwork and keys. The paperwork was a chronicle of all of the plans, permits, receipts and drawings. This man kept track of every dime he spent on this place! There was also a box of keys. Each one was labeled with the name of the room it unlocked. Every single door was on a different lock! Most of the names on the keys made sense. One was labeled shop, one front door, back door, boat house, storage, etc. But when we found one labeled “Banana Room”. We were stumped! By process of elimination we figured out which room it went to but still couldn’t figure out the name. The key went to a storage area under the deck and beside the basement. It had concrete walls, one small window and a dark elevated shelf in the back of the small room. It wasn’t until one of the sons stopped by to deliver a tax bill that we learned about the mysterious banana room. Mr. E. apparently had a banana tree that he planted every year in the spring and dug up in the fall. I guess the winters were too harsh to leave it planted year round. So, Mr. E. stored the banana tree and his bananas in this little room! We aren’t sure what happened to the banana tree but now we use the room as a laundry room and storage area. When we remodeled the upstairs we relocated the stacked washer and dryer to the banana room. The hot water heater was moved from a closet in the Bunk House (the downstairs bedroom) into the banana room as well. We have the old refrigerator in there as well. We use it for storage of cushions, skis, tubes and other lake toys and games. (It is also a holding place for future lighting and projects) We hope to cover this area up with a curtain or sliding barn door at some point. Originally the banana room was outside of the house but when we remodeled the basement we enclosed the covered porch and so the room is inside the basement. It is much more convenient to have the laundry inside of the house! This is how it looks today. Functional but that’s about it! Our plan is to add some shelving and a sink to the banana room. We would love to buy a full size washer and dryer at some point too. The stacked unit still works pretty well for the small amount of laundry we usually do but several of the knobs are broken so we use a wrench to turn it on and adjust the temperature. We painted it a pretty blue and added a fun nautical light fixture overhead. Maybe this summer we will finally get around to finishing this room! I plan on hanging a hook outside the door and hanging the original key on it. 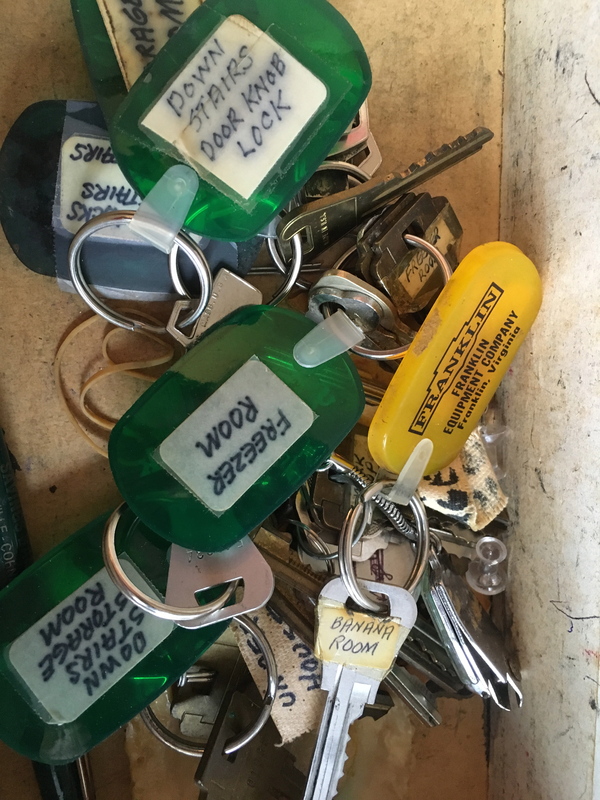 Although we had all of the locks changed early on, and have one key that fits everything, I will always keep the box of original keys. And this room will be forever referred to as “The Banana Room”!